7 Sandhill Crane has been added to your favorites! 7 Sandhill Crane has been removed from your favorites! 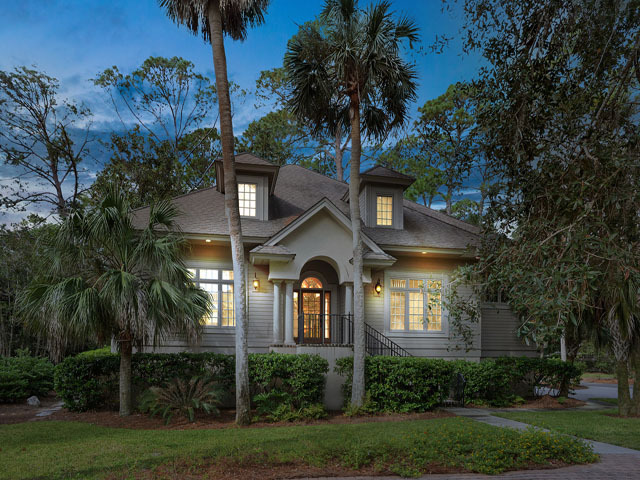 This gorgeous Sea Pines Plantation home offers the finest in furnishings and amenities, interior freshly painted throughout. Upon entry you are greeted by a large great room with 2 story ceilings. 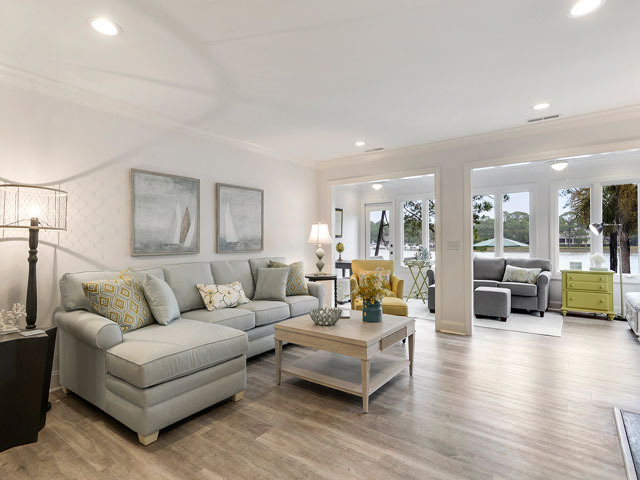 The living room has floor to ceiling windows offering tons of natural light, a sleeper sofa, loveseat and comfy chair, with a large flat screen TV/DVD and completely open to the kitchen and dining areas. The kitchen features a large refrigerator, double oven, gas range, granite counter tops, and a large island with seating for four. The dining room seats eight to ten, perfect for a large gathering. From both the dining room and living room are doors leading to the back patio and pool areas. The patio has a gas grill and table for four. The pool is a large lagoon shaped and is surrounded by landscape making it nice and private. This is the perfect area for an afternoon lounge after a long day on the beach! The beach path is directly behind the home, only a couple of minute walk to a gorgeous private beach. There are two bedrooms on the main floor. The large master suite features a king bed, flat screen TV, a very large private bathroom with double vanity, soaker tub, large glass shower, and a huge walk in closet. The second bedroom on this level has a twin trundle day bed, flat screen TV, and uses the hall bathroom with a large walk in shower. There is also access to the small ‘mudroom’ area that is just off the pool area. This is a perfect place to store your beach chairs, towels, etc to keep the sand from coming in the house. The hall bath is also just upstairs from this room. Upstairs you will find the remaining four bedrooms. The first bedroom is on the second level and has a king bed, reading lounger, flat screen TV and a private bath with a large walk in shower. Also on this level is a large laundry room. On the third level is a comfortable den with a sleeper sofa, recliner and a large flat screen TV/DVD. This is the perfect area for the kid’s movie night. The kid’s room with two bunk beds and a private bathroom with shower/tub combo is just off the den. The other two bedrooms on this level both have king beds, flat screen TVs, and private baths with walk in closets. 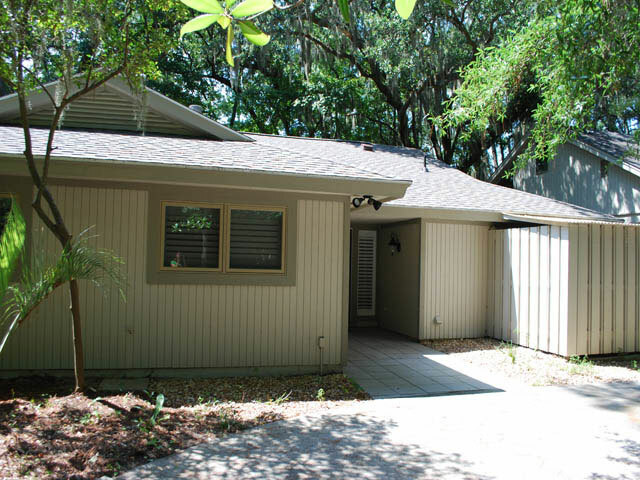 If you are looking for a Sea Pines family retreat you have found it in this home. This is the perfect location and the perfect home for a perfect family getaway! *Free shuttle service through Sea Pines Trolley available March through September.